Kendal 853D is an intelligent 4 in1 SMD (Surface Mount Device) Hot Air Rework Soldering Station. With quality control processor, it ensures rapid heating up, accurate and stable temperature control without being affected by the volume of airflow, which really achieves lead-free soldering and desoldering. With the sensor switch in the handle, the system can quickly enter into operating mode while gripping handle. Meanwhile, the system will enter to standby mode while handle is released. 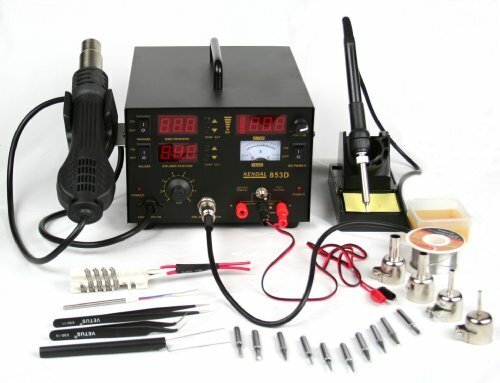 In addition, the system has self-testing and protection capability - making it a safe, reliable, efficient and intelligent rework soldering station. In addition, 15V DC power supply and meter test. Rapid heating up, accurate and stable temperature control. lead-free soldering and desoldering. 15V DC supply and meter test. Self-protection. Auto recovery.